South Australia blew up its last coal-fired power plant this year (an early victim of the LRET) and the Federal Coalition stood idly by while Victoria allowed its 1,600 MW Hazelwood plant to close earlier this year – all to cheers from lunatics like Jay Weatherill and Daniel Andrews. Predictably, the wholesale price of electricity in Victoria has almost tripled. When demand soars during Summer heat waves, reserve capacity is called into play (albeit at an extortionate cost), keeping the grid up and running, businesses ticking along and air conditioners running in those businesses and homes. Coinciding with temperatures in the +40°C range are windless days and nights, which mean collapses in wind power output. 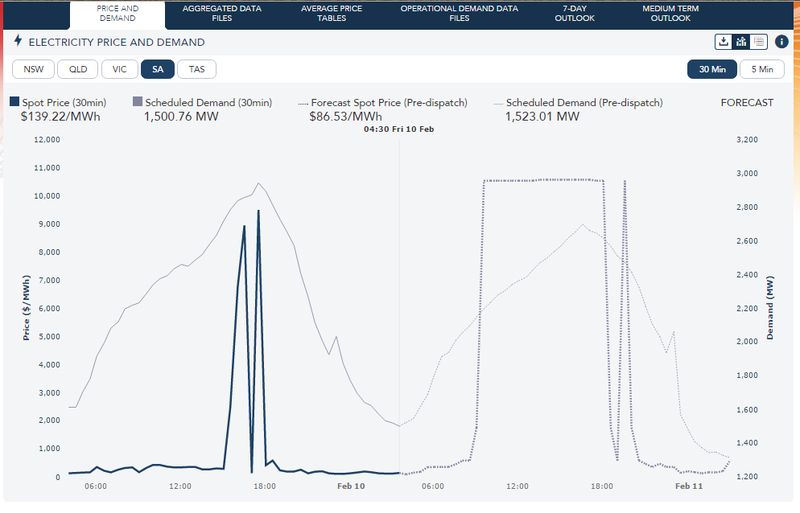 In South Australia, heavily reliant upon its 1,698 MW of wind power capacity, the grid manager simply chops power to homes and businesses in the tens of thousands (what is referred to as ‘load shedding’); and, when the grid manager loses control of its predetermined outages, the system goes black. 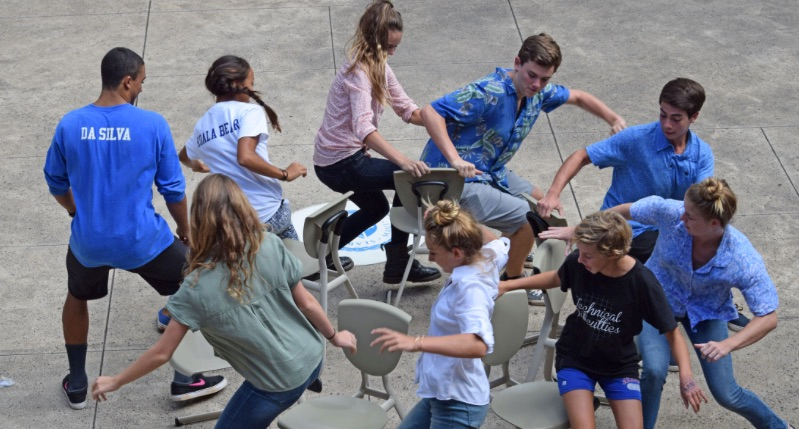 This coming Summer, and beyond, is going to be a little like musical chairs. Except, the contenders will be States (and within those States, power hungry businesses). There simply will not be enough power for all players: businesses like steelworks and aluminium smelters, will be the first to go, with South Australia and Victoria next, in that order. The thrust of the report was picked up by The Australian’s David Crowe. David is a long way from mastering the cause and consequences of Australia’s self-inflicted energy calamity. However, the message in this article is plain enough: Australians have set themselves up for a perfectly avoidable catastrophe. Blackouts and price spikes will hit within months unless action is taken to fix the ­national electricity grid, according to a report that recommends the federal government set up a “strategic” power ­reserve to avert a crisis. The nation’s peak energy regulator has urged Malcolm Turnbull to create the vast reserve to prevent the “heightened risk” of blackouts and brownouts this summer, as the Prime Minister was drawn into a war of words with power company AGL over the closure of a vital coal-fired power station. Mr Turnbull has opened talks with AGL chief executive Andy Vesey to extend the life of the Liddell power station in NSW, fearing its closure will repeat the hit to supply and prices from the shut-down of the Hazelwood coal station in Victoria earlier this year. In a blow to the government’s plans, Mr Vesey immediately rebuffed the calls to keep the station operating, taking to Twitter to say the company was “committed to the closure” in 2022, taking its 1900 megawatts of power out of the grid. “We’re getting out of coal. We’ve committed to the closure of the Liddell power station in 2022, the end of its operating life,” Mr Vesey said. Mr Turnbull insisted last night there were other ways to keep the generator running, revealing he spoke to the AGL boss about selling Liddell to another “responsible party” to keep it operating until 2027. The high-stakes negotiation comes as the Australian Energy Market Operator warns of an immediate shortage of power this summer and a longer-term threat from 2022 if Liddell shuts down as planned. 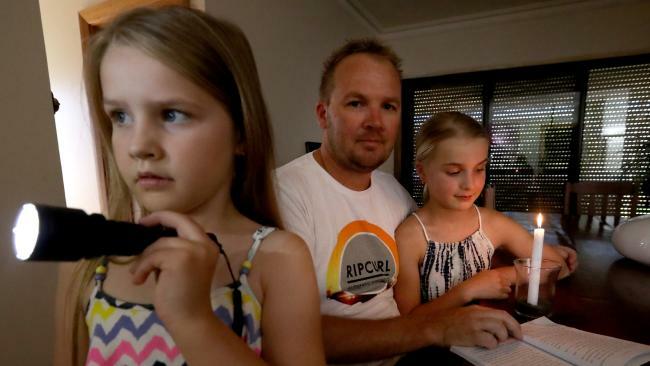 The alarming conclusions, to be released today, say South Australia has up to a 33 per cent chance of failures this summer while Victoria has a risk of up to 43 per cent, raising the prospect of “load shedding” that cuts power to households and businesses. 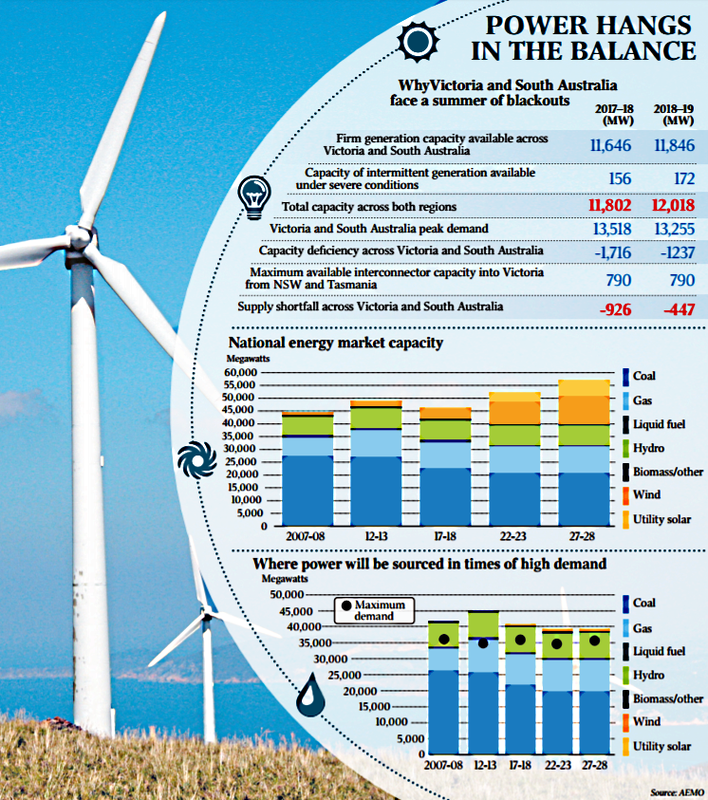 AEMO is scrambling to find spare energy capacity before ­December to fill the gap, in a windfall for companies with diesel generators that can feed power into the east coast electricity grid at premium prices. AEMO warns that NSW has up to a 46 per cent likelihood of “significant” unmet demand after Liddell closes, including outages lasting from two to six hours, unless the strategic reserve is set up to build new generators. The new recommendations are separate from the dispute over whether to endorse a clean energy target to encourage renewable power at the expense of fossil fuels. The government is aiming to address the immediate problems with capacity and reliability before the debate on the target. Energy Minister Josh Frydenberg said the new report on ­“dispatchable capacity” re­inforced measures already underway including mandating that renewable generators provide battery storage to improve ­reliability and all providers give at least three years’ notice before they close, in a bid to repeat the hit to prices and supply when the ­Hazelwood generator closed. Mr Frydenberg said the government would “leave no stone unturned” to ensure affordable and reliable power. AEMO counters the push within the Coalition partyroom for a government subsidy to build new “high-efficiency” power plants, in a clear finding that could reshape the internal debate ahead of the decision on a clean energy target. AEMO tells the government to avoid “unnecessary investment in new power plants with uncertain long-term business ­viability” and echoes similar warnings from the nation’s Chief Scientist, Alan Finkel. The regulator’s new report calls instead for the “possible ­extension of the capability of some existing resources” such as expanding the coal-fired power stations already operating. Dr Finkel said yesterday it would take eight years to build new “ultra-supercritical” coal-fired generators but that the owners of existing coal-power stations could be encouraged to invest $600m to $700m on upgrades to extend their operations by another 10 years. “Investing in ­extending the life of existing coal generators is absolutely in line with our recommendations,” he told the Australia Israel Chamber of Commerce in Sydney. Nationals MPs want the government to consider incentives to expand newer coal power plants such as Kogan Creek in Queensland, one of the country’s most ­efficient generators with a ­capacity of 700 megawatts. The AEMO proposal includes an immediate “special reserve” to be put in place this summer with 1000 megawatts of spare capacity from across the grid, including diesel generators or gas-fired turbines that can be switched on as needed. Companies are lodging bids to provide that power in the “summer readiness plan” but the regulator offers no assurance it will get all the capacity needed. The cost of this reserve power will be passed on to households and businesses in the state where it is needed under an existing scheme called the Reliability and Emergency Reserve Trader. AEMO says customers would be willing to pay an additional $25m-$50m each year to avoid “load shedding” that cuts their power. Another 1000 megawatts will be needed in a “special reserve” from 2022 to cope with the closure of Liddell but there will be no spare capacity by then to fill the gap, forcing the government to offer financial rewards to those who build new generators. The leading contenders to supply this long-term reserve are gas-fired power stations that can be switched on and off at short notice, although the government’s Snowy Hydro expansion might also qualify. The 1000 megawatts is equivalent to two brand new gas-fired power ­stations of the size of Pelican Point in South Australia, a facility that was restarted after the statewide blackout last September. While the expansion of coal-fired power stations could curb the need for the reserve, the coal stations would probably not ­qualify for the reserve because they cannot stop and start at short ­notice. In another sign that reliability will come at a cost, federal and state governments will have to offer “availability payments” to those who bid to provide the “special reserve” electricity, which means they will be paid to be on standby even if they never start. They will get an additional payment if their power is needed and AEMO instructs them to begin generating, putting power into the grid at times of shortage and therefore at premium prices. One thing that the AEMO report makes abundantly clear is that no one in the business of keeping the grid up and running places any value on wind power to deliver even the smallest fraction of its notional capacity. Read between the lines and what they mean to say is that they do not even count wind power capacity as being able to contribute anything at all to the grid, especially when it’s needed most. In other words, they rate the ‘firm capacity’ from wind power generation as zero – with good reason (see above, the entire output for June of every wind turbine connected to the Eastern Grid with a notional capacity of 4,395 MW). What that means, is that those who can deliver power on demand are able to extract a king’s ransom for doing so. We’ll rewind to February this year when a typical Summer hot spell, coinciding with a typical 1,000 MW wind power output collapse, left 90,000 South Australian households boiling in the dark. 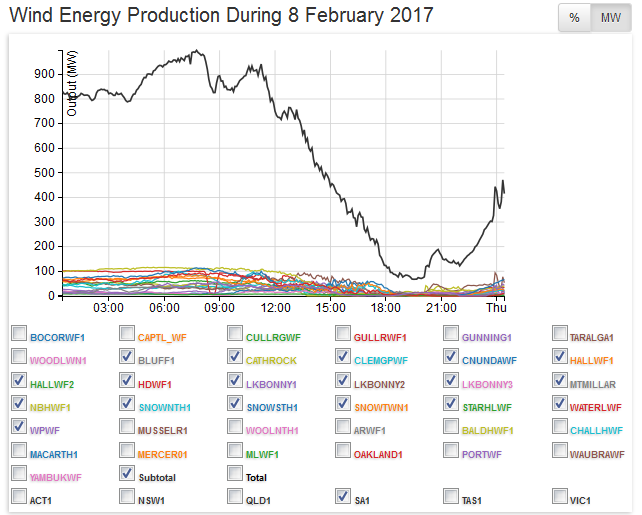 SA’s 18 wind farms (with a notional capacity of 1,576MW) were belting out a tad over 1,000MW around 8am, but gave up the ghost as the day wore on: plummeting to a piddling 70MW by 7pm (or 4% of notional capacity). So much for ‘wonderful, free’ wind energy routinely ‘powering’ hundreds of thousands of South Australian homes. 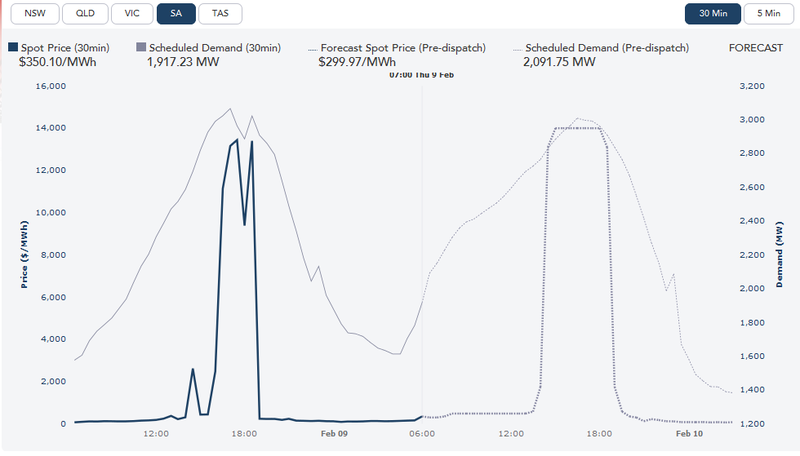 With wind power output heading south, the spot price for the 5 minute interval topped $9,000 per MWh for something that costs coal-fired plant less than $50 to deliver (at a profit). 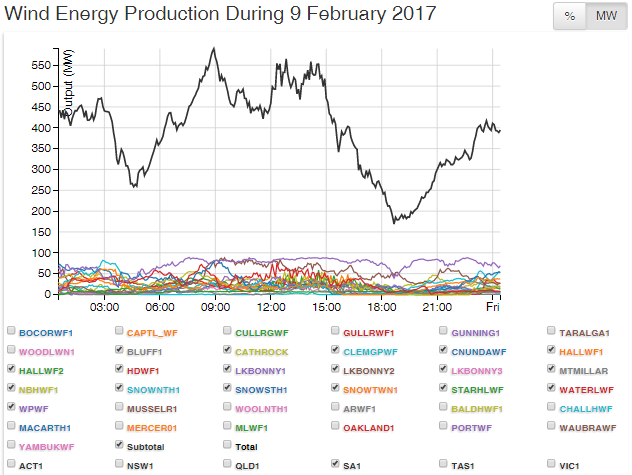 We could go on with further examples – such as 10 February, when much the same wind power driven market chaos occurred – but we’ve probably made our point. 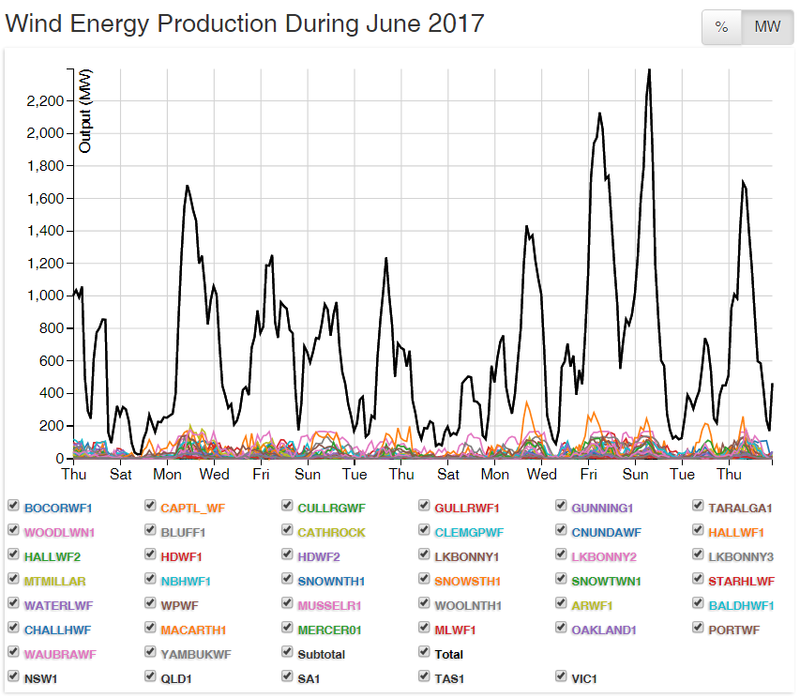 For those inclined to do a little of their own detective work, the (occasional and erratic) wind power output of every wind turbine connected to Australia’s Eastern Grid is helpfully collected on a daily basis by the boys over at Aneroid Energy – linked here. And the daily spot price is available, state-by-state, from the AEMO site – on their data dashboard linked here. All of this was perfectly predictable; and STT predicted it (see our post here). The risk of suffering a blackout is like the risk of missing out on a seat during musical chairs – a game of uncertainty and chance. However, the costs of maintaining a grid reliant on the weather brings with it absolute certainty. South Australians pay the highest power prices in the world and the worst is yet to come. The Victorians that cheered when Hazelwood closed its doors are going to get a taste of what South Australians call their very own: a costly brand of virtuous misery. This Summer, it’s every man for themselves. Welcome to your wind powered future! In his article, David Crowe shows that he is unaware that the AEMO in its final report on the SA blackout stated that there was not enough inertia in the generators (as is available in spinning coal or gas fired turbines) to ride through the disturbances on the line, as when the power lines collapsed. Wind backed by battery will not have that inertia so they will still be in serious trouble as that inertia will be unavailable. Also they stated that the slow recovery from the blackout was attributable to lack of synchronous generators (fossil-fueled generators) which were required to provide the required AC power so that the wind and solar could synchronise. Wind backed by battery will be an expensive disaster. Good times in the home generator market! Have you got yours? I would need body corporate permission but I don’t think they would let me put it on my little balcony. So I guess not. AGL. Australian Gas and Lights Out! The idea that Weather Dependent Renewables (Wind and Solar) are cost competitive with conventional electricity generation when all the financial support mechanisms introduced by governments to support Renewables are eliminated is refuted by the attached calculations. They show that in the European context for both installation and long-term running the overall combination of solar and onshore and offshore wind costs are roughly 11 times more than using conventional Gas-firing. These results stem from EurObserER 2016 data and the 2016 comparative costings published by the US Energy Information Administration. These comparative costs do account for the low Capacity Percentages / Load Factors characteristic of Weather Dependent Renewables but they do not account for the inherent unreliable intermittency and non-dispatchability for Renewables to meet demand. The best comparison at with gas-firing in Europe is achieved by on-shore wind at about 7 times more expensive to install and to run long-term but both off-shore wind and solar energy cost close to 18 times as much when compared to gas-firing. THE incredible cost of “save the planet” virtue-signaling for all to see – if you can afford to turn your lights on, or not suffering through another blackout! The survey that revealed that consumers would be willing to pay an extra $25m to $50m per annum to avoid blackouts collected data from November 2013 to July 2014. Perhaps Josh should ask AEMO to redo the survey after we receive our next electricity bill. Wait, he knows the answer. We already pay for a solid gold service. We will be entitled to a rebate after each blackout. Ah yes, but no sooner than the AEMO report had been released the rent seekers and twitter jockeys were in a tail spin. Of course the last winter was the hottest on record and the hurricanes in Florida were the inevitable result of climate change. Then the lovely Audrey, herself recently appointed CEO of AEMO was on the airwaves of the national broadcaster the ABC. And of course her green slant on the state of the energy market was to push ahead with more renewable projects. “Demand response ” was one of her initiatives. Whereby the average punter during the midst of the heatwave takes one on the chin for the environment by volunteering to have the air conditioning, beer fridge and pool pump shut down. With the lovely Audrey there will be no bacon and eggs for Breakfast at Tiffany’s, just Weet Bix and not so cold milk. I guess we will all have to live on love!